Thanks for playing! We will contact the winner via instagram today. Speedo will randomly select the winner. The contest runs from today through Feb 25th 2019. SwimSwam will DM the account and put you in touch with Speedo to receive your prize. Building on its unparalleled heritage in competitive swimming, Speedo – the world’s leading swimwear brand – today launched its most advanced Fastskin range of elite swimwear and goggles: The new Fastskin LZR Pure Intent and Fastskin LZR Pure Valor suits, and Pure Focus Goggle. 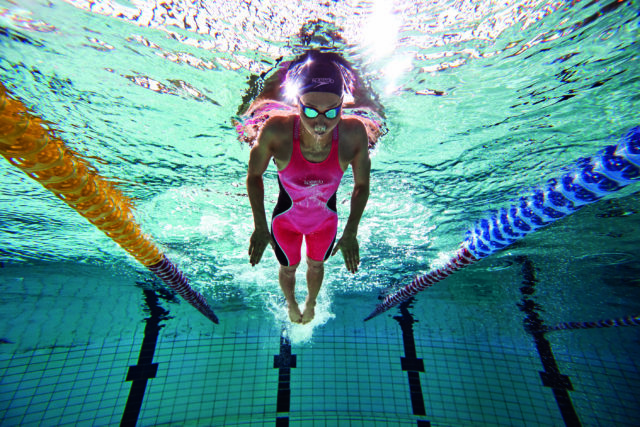 As part of the customizable new collection, the brand’s global research and development laboratory, Aqualab, has developed a first-of-its-kind suit in the Fastskin LZR Pure Intent, which features a fusion of three brand-new fabrics that allow for targeted compression and a wider range of motion. The fabrics target flexibility, compression and drag reduction in the areas that need them most, and have undergone rigorous flat plate testing to identify which fabrics were fastest individually and when combined. Both the LZR Pure Intent and LZR Pure Valor suits – the latter of which is a smart update to the swimmer-favourite Fastskin LZR 2 suit – will come in a powerful, strong Black colorway and a brand-new, empowering and energizing Psycho Red colorway, which is designed for athletes who want to express their personalities in a new, brighter color. Male suits will be available in regular and high-waisted styles, and female in open- and closed-back styles. Speedo has also revealed its new high-performance Fastskin Pure Focus goggle, which features the brand’s IQfitTM 3D goggle seal and a newly-designed hybrid nose bridge adjustment that reduces drag profile. Brand new in competitive goggles, the nose bridge slides out to aid in size adjustment, add comfort and bring ease to changing the nose piece. The goggle will be available in Dark Ice and Bright Fire colorways. Speedo created this next generation of Fastskin products with innovation and a swimmer’s needs in mind, a focus that has been at the forefront of its Fastskin line for the collection’s nearly 20 years of existence. The Aqualab team – comprised of experts in textile technology, garment engineering, sport science, computational fluid dynamics, testing protocol and design – drew from a deep understanding of hydrodynamics, the biomechanics of water, high- performance testing and fabric technologies to create the new line. The Aqualab team traveled 350,000 miles over three years to test the suits and goggles with 330 swimmers, including Caeleb Dressel (USA), Ryan Murphy (USA), Joseph Schooling (SIN), Emma McKeon (AUS),Mireia Belmonte Garcia (ESP) and Siobhan-Marie O’Connor (GBR), as well as club swimmers, masters swimmers and 10 world-leading coaches to ensure each iteration of the product was properly calibrated to best support elite and aspiring competitive swimmers. The new Fastskin LZR Pure Intent and Fastskin LZR Pure Valor swimsuits are FINA-approved. Both suits, as well as the Fastskin Pure Focus goggle, will be available to purchase from March 4, 2019, and can be pre-ordered now at SpeedoUSA.com. About PVH: With a history going back over 135 years, PVH has excelled at growing brands and businesses with rich American heritages, becoming one of the largest apparel companies in the world. We have over 36,000 associates operating in over 40 countries and nearly $9 billion in annual revenues. We own the iconic CALVIN KLEIN, TOMMY HILFIGER, Van Heusen, IZOD, ARROW, Speedo*, Warner’s, Olga and Geoffrey Beene brands, as well as the digital-centric True & Co. intimates brand, and market a variety of goods under these and other nationally and internationally known owned and licensed brands. Swimming news is courtesy of Speedo USA, a SwimSwam partner.